HomeKSHB is adding news. So does KMCI. KSHB is adding news. So does KMCI. FIRST ON THE BLOG (other than KSHB.com): KSHB is adding more news to weekends. But it isn’t KSHB making the headlines… its their sister station KMCI. 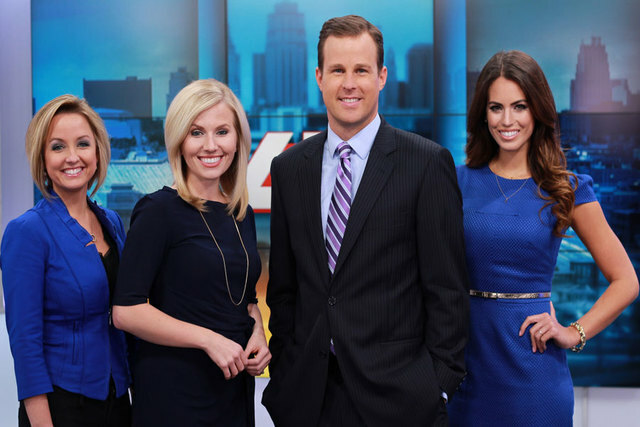 According to KSHB.com, starting Monday April 6th, 2015, KSHB 41 will add a 1-hour extension of its morning newscast on KMCI 38. Titled 41 Action News Today on 38 The Spot, the broadcast will be an hour-long from 7:00-8:00 a.m., unlike the current 7:00-9:00 a.m. newscast on KCWE 29 from KMBC 9 or the 7:00-10:00 a.m. newscast on WDAF 4. The program will continue to be anchored by Patrick Fazio and Lindsay Shivley, as well as No Wait Weather and Traffic with 41 Action Weather Meteorologist Kalee Dionne and 41 Action Traffic with traffic reporter Kacie McDonnell (who now also works for the Sporting K.C. MLS franchise). According to KSHB 41, viewers should expect plenty of sports coverage, as well as trending internet topics and videos, and lifestyle reports for families. This will be KMCI 38’s first LIVE newscast in 12 years, as the station used to air a LIVE half-hour primetime newscast at 9:00 p.m. from KSHB 41 from 2000-2003, when it was canceled due to low ratings. … Starting on the weekend of Saturday April 11th, 2015, KSHB 41 will move and add 90 minutes of news on weekends. First, KSHB 41 will add a 6:00 a.m. hour of 41 Action News Today. It will be added on Sundays, but it will be moved from the 8:00 a.m. hour on Saturdays. This is done so that KSHB 41 can air The Today Show, 7 days a week at 7:00 a.m. KSHB 41 will continue to air 41 Action News Today on Saturday mornings at 9:00 a.m. and on Sunday mornings at 8:00 a.m. KSHB 41 will become the ONLY station the area to broadcast local news at 6:00 a.m. on both Saturday and Sunday mornings. Also, on Saturday April 11th, 2015, KSHB 41 will expand the Saturday 6:00 p.m. newscast to an hour-long newscast. This will put the newscast in competition with KCTV 5 and KMBC 9 for local news in that hour, since KCTV 5 and KMBC 9 both produce local news on Saturdays at 6:00 and 6:30 p.m. (KCTV 5’s 6:30 p.m. newscast is on KSMO 62). 6:00-7:00 AM: 41 Action News Today at 6:00 a.m.
9:00-10:00 AM: 41 Action News Today at 9:00 a.m.
8:00-9:00 AM: 41 Action News Today at 8:00 a.m. This is great news for an already-heavy news media market which is #31 – Kansas City. ← RUMORS: WPIX may add a 6:00 p.m. newscast. God bless the local news. Is the Now KC at 4:00pm on KHSB considered a local newscast.? What kind of format does the NOW show have on it? Other Scrpits TV Stations like KMGH The Now Denver, KNXV, The Now PHX, WEWS-TV, The Now Cleveland, WXYZ-TV The Now Detroit, WPTV-TV, The Now South Florida at 4:00pm. Is the Now program a hybrid of both local and national newz? Is the Now Show a talk show? I don’t think so. I’ve always considered it as a lifestyle/social media newscast that’s unlike the traditional norm.